Royal Spanish Navy barquentine Juan Sebastian de Elcano passes Graves Light on June 15, 2015. 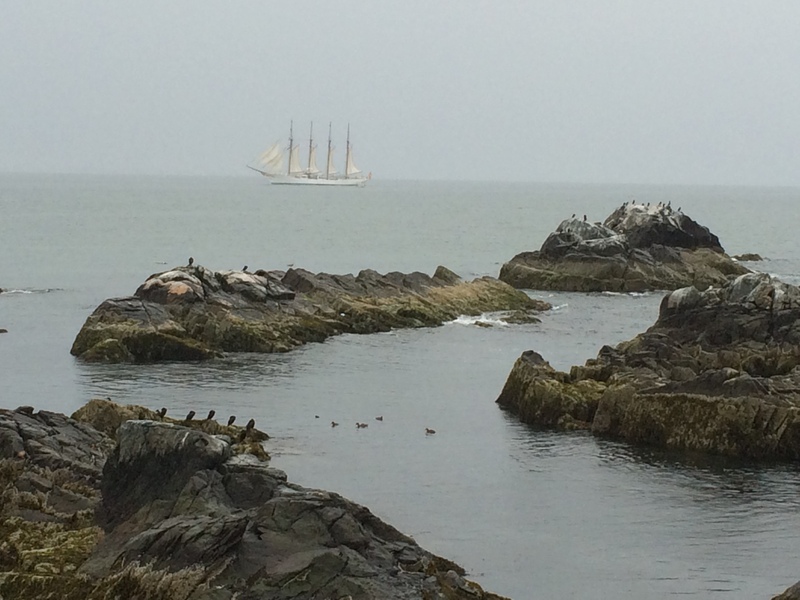 The third-largest tall ship in the world treated us to an early-morning visit, of sorts, here at Graves Light. We remember first seeing this beautiful vessel as kids with our dad during OpSail ’76, when the Elcano visited Boston to celebrate our nation’s bicentennial. That day was also the first time we set eyes on Graves Light, from our dad’s Tanzer-22 sloop. Juan Sebastian de Elcano – named after the great Spanish explorer who captained Ferdinand Magellan’s circumnavigation of the earth – has logged more nautical miles than any other sailing vessel in history. Since its keel was laid in 1927, the Elcano has sailed 2 million nautical miles. We call it a brig-schooner because that’s what the Royal Spanish Navy calls it on its English website. However, on the official Spanish-language version, the vessel is called a “barque,” which would also make it a “barque” or “bark” in English. Others call it a brig, because of the square rig of its foremast, or a barquentine. We don’t pretend to be experts on the rigging of sailing vessels. We’re just excited that the great Spanish sailing ship passed by today. Tagged Juan Sebastian Elcano, Spain.